This Pivoting Scan Hook For Grid And PowerWing is actually the result of incorrect installation. It is nevertheless a fascinating example of fixture possibilities. Hooks and dividers that angle into traffic flow exist. 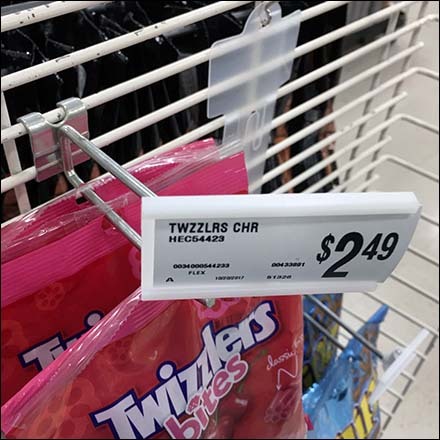 Why not a Scan Hook Label Holder that does the same? Look close to see that if this Label Holder was installed correctly it would lock in position facing directly forward. Add locking positions at 45º angles and it could lock into position at 3 angles. Once the 3-position mold was built, 3-way Label Holder Mounts would cost no more that 1 position points. Imagine the new display possibilities! This Pivoting Scan Hook For Grid And PowerWing seen at Marshall’s.